I have an Edge 8" and AVX mount and want to add an auto guider to the setup for longer exposure times. Being it has a long focal length even with the .7 focal reducer I am wanting to mount an 80mm refractor with a dovetail and rings for a guider, then also serve as another scope to use for pictures. Using that as a guide scope, then also be able to put the camera on there to use for photos. Is this too much weight for the AVX mount? It would be a total of 19-22lbs with all the gear on it. My advice would be to avoid a guide scope entirely and use an OAG with your camera. You'll have less weight and no problems with differential flexure. Even with the reducer you're still at 1400mm which is not an easy place to start learning AP. Spend the money on a 16 bit sensitive guide camera, you'll then find it easy to find stars. The WOStar 71 is a great choice for the AVX ... it will help a lot if you take the Edge8 off first though. The long focal length of the Edge is going to make learning imaging challenging; the short focal length of the WOStar 71 will make things a lot easier for you. Also, the AVX is rated for 30 lbs ... but that's a visual load and use. For imaging, 20 is pushing it. Ross is giving great advice - if you stick with the edge, use an OAG. I posted some images in the AP area of my first ones. Actually its not too difficult once I get the mount polar aligned to 00's. Many users of a larger SCT get a small refractor to complement it, and in your case sharing the one mount, one at a time. I'm still using the refractor that I bought 4 years ago. I tried initially to learn on a C11 with a guidescope system (Orion ST80 and SSAG) and I got nowhere for about 2 years. I swapped out the C11 for a refractor and the DSLR for a CCD/OAG combination and I got results the first night I was out that I still think are OK. I think that people do go AVX C8 guidescope with good results but it's just so much easier to learn with a refractor. That Williams would actually be a good choice! You could probably do 30 second unguided images with great wide field results and learn a lot about processing. I will second Ross' suggestion above to ditch the guidescope and go with OAG. I tried for years to image with both an EdgeHD 8" and an EdgeHD 11" on two different mounts (CGEM and AVX) and could never get the differential flexure issue under control until I moved to OAG which solved it instantly. Finding a guidestar with OAG is an enormous pain in the a** compared to a relatively wide-field guidescope but the extra hour you spend doing it will save you hours of exposures you can't use. As for the mount, I have an AVX that I tuned myself that consistently turns in < 0.70" guiding with a 30lbs refractor on it -- right at the stated weight limit. I think an EdgeHD with guidescope and all the trimmings is going to com in around 22-25lbs on that mount so it should handle it for at least 5 minute or less exposures, assuming you go OAG. If you go with a separate guidescope in that configuration, I predict you'll end up having to throw away 50% of your exposures. If you can live with that, power to you. I don't think this is too much weight, but I have the same setup and have found one of the 50mm finder/guiders works at least as well if not better. Guide scope focal length is not a big deal these days, and any problem there is offset by me being able to mount the 50 more securely. Edited by rmollise, 24 August 2015 - 09:09 AM. All of the above are good advise. Until you watch the guiding graph of PHD2 and get seasick, you have no idea how much slack is in the mount. Get ready for this. Have used the AVX/Edge HD with 23 lbs before on a night with no wind. Need to use Periodic Error Correction to get anything out of this mount as well as guiding. Where is Ray when you need him......Ray can you help here? Might want to invest in PEMPro if planning to used the AVX with this type of load. The dirty truth is the mount is good for 60 second images at F/7 or F/10 with an 8" Edge HD, and plan to toss 1/3 of your subs. Nice thing about the AVX is the 6 star calibration model is pretty good. Edited by Hobby Astronomer, 24 August 2015 - 12:57 PM. I'm curious about Rod's statement about mounting the "50 more securely". I've always thought that an OAG with bolts or screws together is bound to be less flexible than a guide scope arrangement. Is the argument that having an extra pound or two hanging off the focuser is a problem or is it more subtle? By the same token I'm pretty sure while you can get away with a properly mounted guidescope these days at this FL, it will be more of a struggle to learn with than mastering an OAG. I may be spoiled by having an STi (another change from 4 years ago) guide camera, but in four years I've never had to do more than rotate my camera to get a star anywhere I've pointed the scope using an OAG. Since I never remove the guide camera from the OAG I very rarely have to refocus. Whatever you decide, once you get good focus with the guide camera mark everything carefully so that you can duplicate it every night. It's a nuisance to have to focus a guide camera over and over again. I used a par focal ring for that purpose (cheap and accurate). Copied this from another post. I exchanged pm's with CN'er bunyon who confirmed you can record PEC with the handset alone while guiding. Align and polar align, pick a target or bright star, start PHD guiding, go to the PEC record on the handset, start recording PEC, the mount will find the index on its own and sometime after 10 minutes or so the handset will say PEC has been recorded and stored. Align and polar align, start PEC playback from the handset, wait a minute or two until the index is found (the mount moves a bit during this), slew to your target and center or frame it as desired, you are now ready to begin unguided imaging or you can start PHD for guided imaging while playing back the PEC. Edited by Hobby Astronomer, 24 August 2015 - 04:47 PM. Does this sound like a good setup with my Edgehd 8" with .7 focal reducer? For full focal length imaging with the C8 I'll recommend using an OAG and a sensitive guide cam as mentioned before. I can easily go for 10 minute subs on my setup that way. Finding a guide star was a pain until I started using my iPad to control the AVX using SkySafari Pro. With that I just use the on-screen controls to move a suitable guide star into the FOV of the guide camera in a snap (see attached screen shot). I will not buy a reducer for wider fields, instead I just ordered a William Optics Star 71 apo for getting truly wide fields. So would Stellarium work for this as well then? Also if I do go with an OAG I thought about getting the Thin Orion OAG, since I can use that I believe with the focal reducer. What is the best guider camera I can use in the $300 range, that will have good results with an OAG? 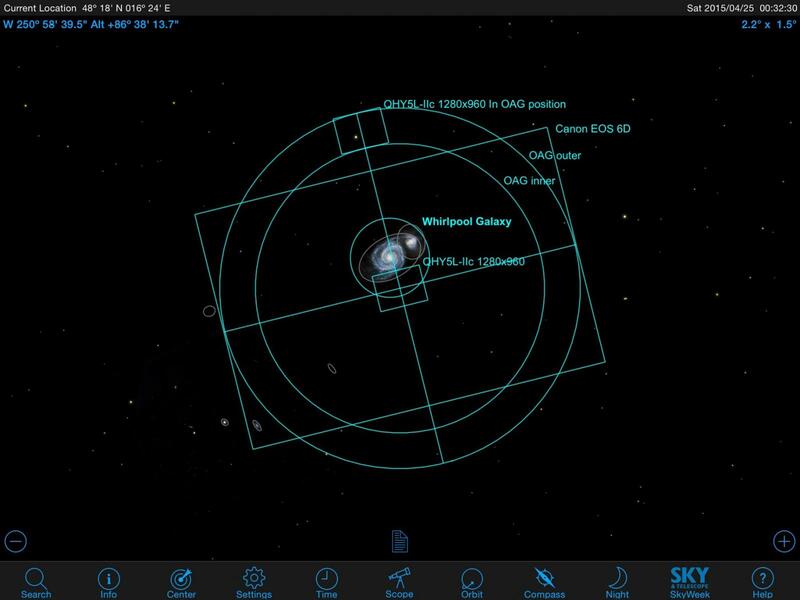 To my knowledge Stellarium does not allow the definition of the FOV of an offset (OAG) sensor. With SkySafari I was able to define several sensors shown simultaneously which I "misuse" to display the FOV of EOS 6D, the OAG camera and the path the OAG camera covers when rotating the whole camera assembly. There are other free programs out there which can do that, i.e. Cart de Ciel (Sky Chart). Since I can control my AVX wirelessly (WLAN) with The iPad I prefer SkySafari. BTW, I found a sensitive guide camera also an absolute must when using an OAG at 2000 mm focal length. Initially I was using my QHY5LIIc color planetary camera for guiding but then switched to the much more sensitive camera coming with the MGEN autoguider. That made a huge difference as I can easily guide on mag 12 stars which dramatically increases the chance of finding a star close by the object of desire. Edited by cray2mpx, 29 August 2015 - 12:27 AM. Here's the issue. The AVX has a plain bearing on DEC. The more weight you put on the mount, the more likely your DEC motion gets sticky, and rough. But they vary, so it's hard to say when it becomes a problem. As far as guide cameras for $300, most like either the ASI120mm or the QHY5L-II. They're almost identical, same chip. Edited by bobzeq25, 29 August 2015 - 12:40 AM. Ok the ASI120mm was actually the one I was looking at getting for the guide camera, plus could use it for planetary pictures also. Thanks. Oh is there anything I need besides the Thin OAG, guide camera to get everything hooked up and make sure I can reach focus with both the DSLR and ASI120mm ? I have the Edge T adapter and T ring already. Just wanna make sure I get all the parts I need right away. Anyone have experience on the Orion Thin OAG and using an ASI camera with it? Will I be able to get the camera into focus with the guider and focal reducer?